Under en festival i bjerg-resortet Nagarkot på kanten af Kathmandu-dalen førte lokale uoverensstemmelser til at en frustreret og sindsforvirret militærperson gik amok og dræbte 12 personer og sårede mindst 19 personer. En dybt tragisk begivenhed, der efterfølgende vil blive efterforsket af lokale menneskerettigheds-organisationer og giver anledning til sympatiaktioner fra de politiske partier fredag den 16. december vendt imod hærens generelt hårde fremfærd mod lokalfolkningen. NAGARKOT, 15 Dec 2005 (IRIN) - Nepalis have been left shocked at the killing of 12 civilians by a deranged soldier at the Kali Debi Mandir Hindu temple in the popular tourist destination of Nagarkot, 32 km east of the capital, Kathmandu. 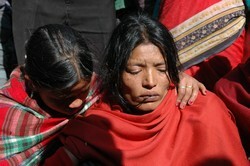 The civilians were shot in cold blood on Wednesday by an allegedly drunken Royal Nepalese Army (RNA) soldier. Witnesses told IRIN at the incident site that the soldier, Basu Deb Thapa, had had a row with some local criminals and in less than 30 minutes, he returned with an automatic rifle from the nearby army barracks. At around 22:00 local time, when Nagarkot’s most popular religious festival was in full swing, the soldier started shooting blindly into a crowd of villagers. Some witnesses say the soldier, who was not in uniform, then shot himself while others say a second soldier killed the perpetrator to stop the carnage. Human rights abuses against civilians by the armed forces are common in Nepal. Three of the dead were young women. In addition, 19 people are now receiving emergency treatment at an army hospital in Kathmandu for bullet wounds. “We’re very scared. These are the people [the army] who were supposed to protect us but they are the ones killing innocent people,” explained a local witness who was too shaken to reveal her identity. Army officials said at a press conference that an investigation into the massacre is under way. The government has also formed a high-level judicial investigation team that has just five days to present its findings. The Nepal Office of the United Nations High Commissioner for Human Rights (OHCHR), as well as local human rights groups, has gone to the place where the killings happened to interview witnesses. During a mass pro-democracy rally by Nepal’s seven main political parties on Thursday, the leaders strongly condemned the incident and criticised the army for allowing a soldier out of uniform to carry weapons into a peaceful gathering. The parties have called a strike for Friday in the capital in protest at the killings. © IRIN - This article appeared originally on IRIN News.org and is published by engelund.dk according a general agreement. To view the original article, please click here. IRIN (Integrated Regional Information Networks) is a project of UN Office for the Coordination of Humanitarian Affairs.